Defrost the hen if frozen. Rinse and pat the hen dry with paper towels. Place it breast side up and, using a sharp knife, cut hen in half by slicing down the middle of the breastbone to separate the rib cage, then cutting all the way through. Slice the onion, put it into a bowl, and add ½ teaspoon of salt. Massage the salt into the onion and squeeze it with your hand until the onion gets soft and a little juice comes out. Season the hen with salt and pepper to your taste. 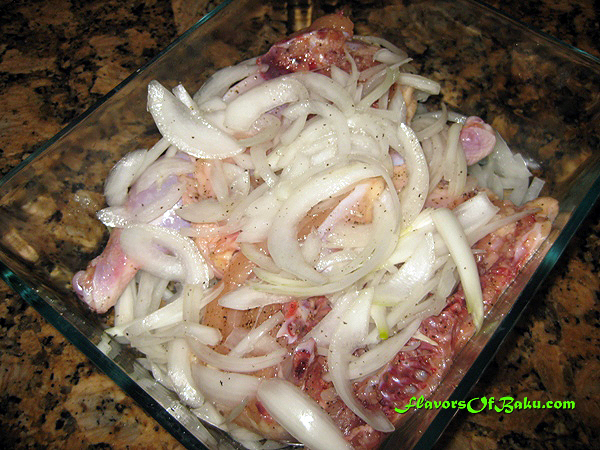 Place half of the sliced onion into a container, then place the hen skin side down. Cover the hen with the remainder of the onion. Marinade overnight in refrigerator. 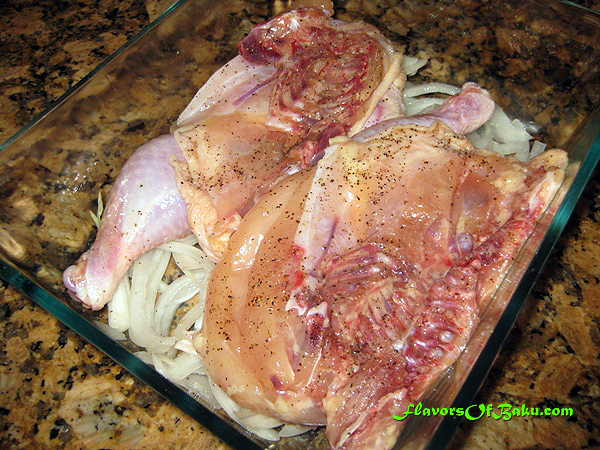 Marinating the hen (or chicken) before cooking will result in moist, tender, and perfectly seasoned meat. 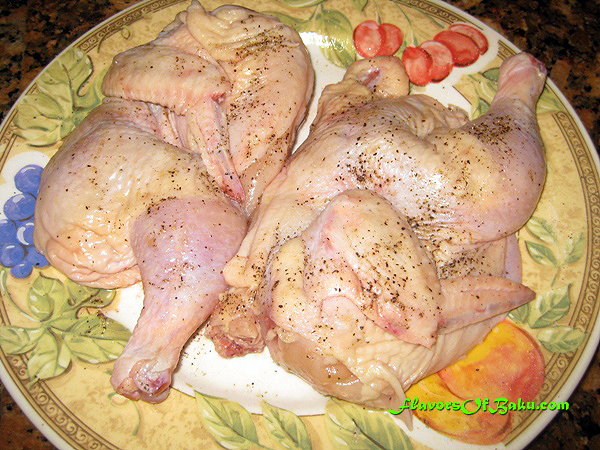 Remove the hen from refrigerator to one hour before roasting, and remove all onion from the hen. 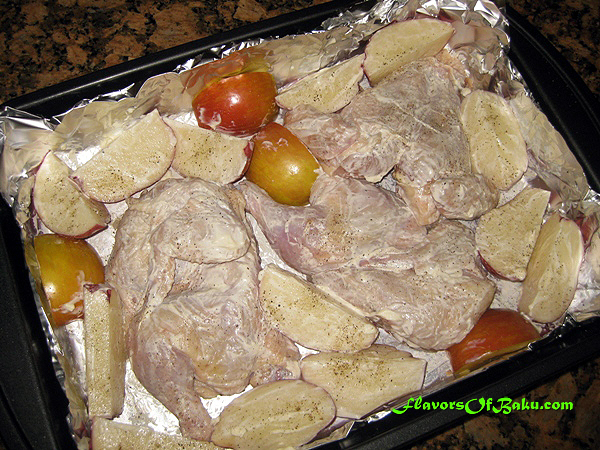 Cut the potatoes and apples into large pieces. Pour melted butter over the roasting pan, then place the hen (skin side up), potatoes, and apples in a roasting pan and rub them all over to coat evenly with mayonnaise or sour cream. Preheat the oven to 400°F (200°C). Add 1 cup of chicken broth or water into the pan and roast until the hen and potatoes are cooked and golden brown. 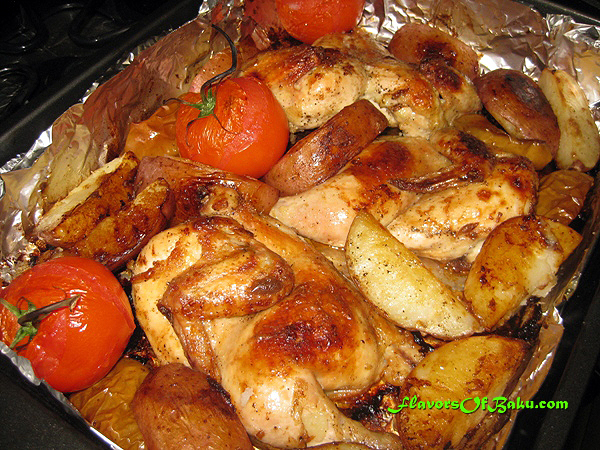 Remove the pan from the oven every now and then to baste the hen, potatoes, and apple all over. You can do so by using a spoon to scoop up the juices and pour them on top, or you can use a brush. 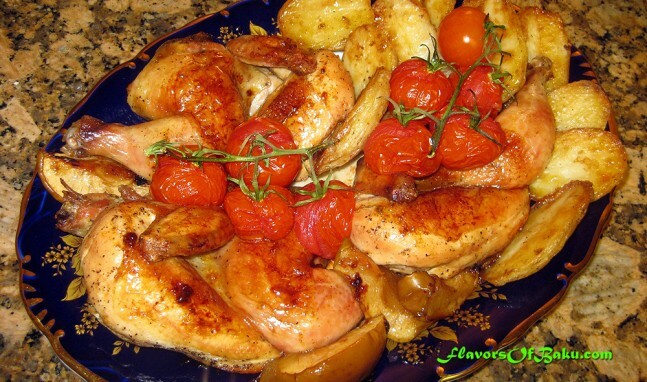 When the hen is almost done cooking, place some tomatoes into the roasting pan as well.